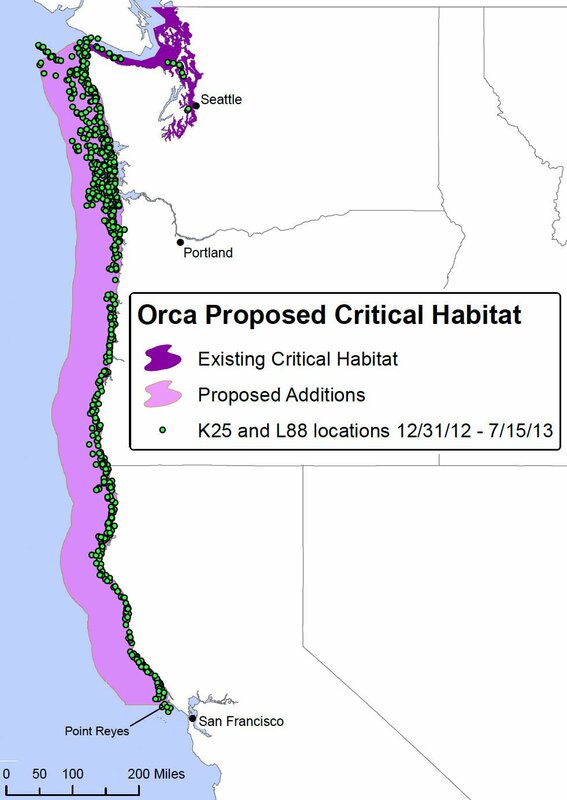 Based on satellite tracking that found tagged Puget Sound orcas at the locations marked in green, an environmental group in 2014 proposed a large expansion in the area designated as critical habitat for Southern Resident Killer Whales. Members of the Puget Sound and Columbia estuary's south resident orca population. Southern Resident Killer Whales achieve nearly unanimous popularity in the communities surrounding Puget Sound, acquiring folk hero status in the past half century. Their trials and tribulations are fodder for endless coverage on Seattle TV news; 153,000 people currently belong to the Orca Network on Facebook, devoted to fan mail and reporting up-to-the-minute sightings. Their perils are real. Numbering a scant 75, they struggle to produce young. Some suffer from malnutrition. This has sparked concerted efforts by Washington state and federal agencies to understand what ails them and how best to respond. On April 3, the Center for Biological Diversity and Wild Fish Conservancy sued in federal court, alleging the National Oceanic and Atmospheric Administration — which oversees ocean fisheries — isn’t doing what it should to ensure an adequate stock of the orcas’ favorite menu item, Chinook salmon. Keeping different orca groups straight is a matter of frequent public confusion, so it may be useful to remind that those based in Puget Sound only eat fish. Other orcas that roam the North Pacific prefer to dine on smaller marine mammals, including sea lions, seals and sea otters. These red meat-eaters are doing just fine, population-wise. The debate is all about how to help their fish-eating cousins. Until a satellite-tracking program between 2012 and 2016, it was little realized that Puget Sound’s orcas should really be considered residents of the entire Pacific Northwest coast. The satellite found them ranging down the outer coast in the winter and spring on a fast and perpetual quest for salmon. Although tracking was discontinued after an orca died from a tag-related wound, it’s clear that the whales go where the salmon are — or at least where they think they’ll be. Earlier this month, about three dozen were observed in Monterey Bay. Based on past behavior, they’ll circle back toward the north, focusing much of their hunt on the Columbia River plume, returning to the Strait of Juan de Fuca after all the possibilities are exhausted here. Since at least the end of the last Ice Age, the mouth of the Columbia was reliably a place of astounding abundance. Although research indicates there were bad years for salmon returns long before dam construction, the worst runs then were undoubtedly better than the best returns today. A much larger coastal orca population would in those times have conducted a movable feast between the Frasier, Columbia, Sacramento and other river systems. Even in these diminished times, they continue their old traditions. Many close observers of salmon management foresaw this lawsuit as many as five years ago, when it became apparent that the Columbia played an important part in the Puget Sound orcas’ annual plans. Already seriously limited in order to honor treaty obligations and allow upriver passage of endangered wild-spawning fish that intermix with returning hatchery salmon, ensuring there are sufficient spring Chinook for orcas will present managers with a daunting task in designing sport and commercial seasons. A food shortage certainly isn’t the only threat faced by our resident orcas. Probably because they spend approximately two-thirds of their lives in an urban chemical soup from runoff into the Sound, they are among the most contaminated wildlife on the planet. 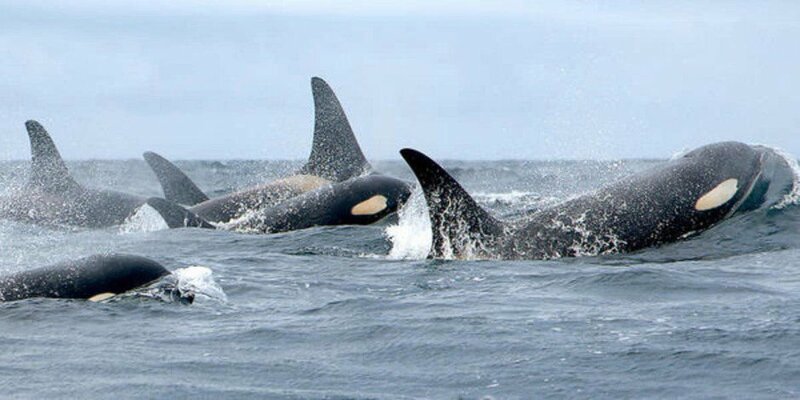 Their habitat vibrates with vessel noise, both coincidental from busy industrial traffic and deliberate from whale-watching excursion boats. But not having enough to eat makes everything more difficult. While the lawsuit doesn’t demand explicit action items (see https://tinyurl.com/Orca-Salmon-lawsuit), instead calling on the court to rule that NOAA is violating the Endangered Species Act, a favorable ruling could result in a cavalcade of responses. In the immediate term, Chinook fishing seasons might be curtailed when orcas are present or face a long-term hiatus in a effort to rebuild salmon stocks. While Washington state is ramping up production of hatchery salmon to provide more for all user groups including orca, the presence of the Wild Fish Conservancy in the litigation suggests a broader aim. Conceivably, this might include wholesale changes in watershed and fisheries management in hopes of producing mammoth-size salmon like orcas once relied upon. In a broad sense, many residents of fishing-dependent communities share the desire for more salmon for everyone. Everyone longs for the good old days. A local gillnetting advocacy group is literally named Salmon For All. Two generations ago, our region fought hard to oppose unfettered dam building, and on behalf of adequate provisions for fish passage, in-stream flows and other mitigation measures once dams were pushed through over our objections. In the years since, habitat conservation and restoration, hatchery reform, management of predatory species and other steps have all gained local support. And they have made an incremental difference. But this year of dismal spring Chinook returns proves the limitations of all these efforts in the face of disastrous ocean conditions. We, salmon and orcas are all paying the price for warmer waters and resulting disruption of the ocean food web. This isn’t to suggest that we shouldn’t continue to improve whatever is within our power to influence. But faced with enormous systemic failures, demonizing NOAA and fishermen isn’t the answer. Sea otters almost equal orcas in terms of iconic status, and yet it is both sad and enlightening to see the degree of animosity felt toward them by some California crabbers and abalone divers, who perceive otters as bitter rivals for shellfish. It would be an unfortunate blunder if this new litigation on behalf of orcas turns them into just one more enemy for imperiled Columbia River commercial fishermen. It may well be true that federal managers have not acted quickly enough to incorporate outer coastal salmon into orca-recovery plans. Judicial action may expedite a response. After that, however, pragmatism and cooperation will achieve a lot more than heavy-handed micromanagement. We all must work together to ensure there are enough salmon for all, including orcas and future eons of salmon. Angry battles over who gets the last fish will sink us all.